This devious being was born "The Cunning Artificer" and possesses the power to forge magical and mystical objects that should only belong on the Disc. Some say they possess the power to entrance most honest people, and relieve them of their wits (and their hard earned cash). After he crossed over to Roundworld, he realised he had to use our currencies to gain power, so he sold his smuggled wares as 'Clarecraft'. Eventually, this led to the setting-up of a Discworld Emporium in Wincanton, Somerset. Still residing there today, The Cunning Artificer gets more cunning by the day. 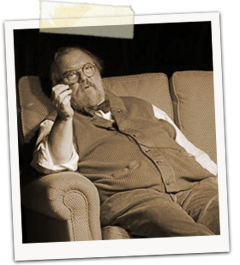 Mr "Bernard Pearson" - as he is now known - was a guest at all the previous IDWCons, and in 2017 you may encounter a bearded, pipe-wielding fellow with a thunderously jolly demeanor mingling with the IDWCon attendees over a pint of Celtic goodness and a long and colourful chat. But beware, good citizens, for he is not all he seems.